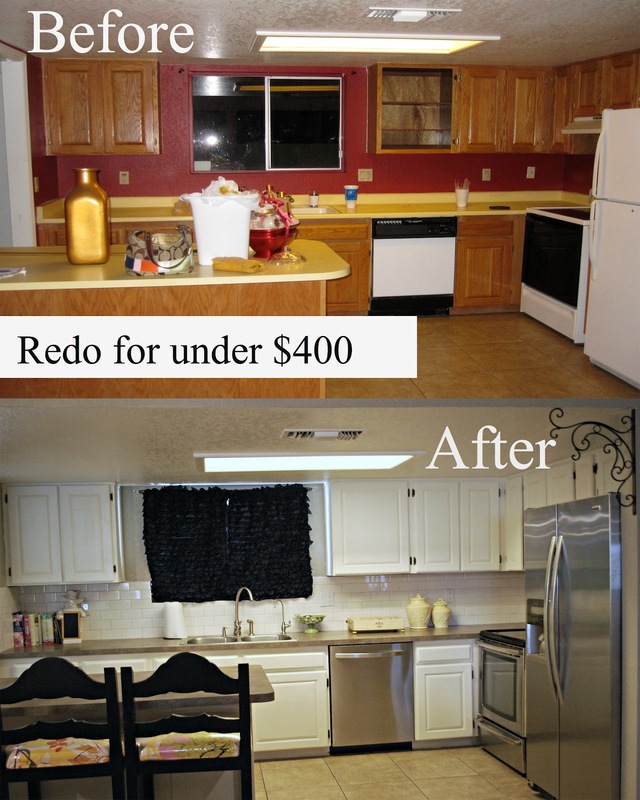 My Kitchen Redo under $400! My Kitchen under went a HUGE overhaul when we moved in. We did not have much money for the “look” of the kitchen because we need to buy all new appliances. Can you even believe the difference! This kitchen was ready for a face lift and we were able to give it a make over, all by ourselves with a VERY limited budget! I mean like less then $400 dollars (excluding the cost of appliances). If you look through the window you can see all the furniture I have in need of some makeovers! I won’t even lie….. I LOVE my new kitchen appliances! We got them at the sears outlet store they carry stuff that has minor little dings and dents… I could not even find the dents or dings on these, the store people had to point them out. Its a great place to find good deals! I have have this sign forever and I love having a spot to hang my keys! I still need to print out something cute to go into that little picture frame in the middle of the key holder! Here is the hubby working away! I am very lucky to have a husband who really knows a lot about doing projects! If you take a close look you can see into the playroom…. thats not quite done but is soooo fun, the dragonfly and flower on the walls are wooden and my mom and I hot glued them to the wall! Hey whatever works! Counter tops: FREE!!!! can you believe it… they were a gift, from a company that my father in law deals with for business! It comes in 16 different colors and is a cheaper way to update countertops! If any of you have used it I would love to hear what you think about! I love when a project can be be done all by ourselves! WOW, it looks brand new! I love it! And such great luck on the counters! What a difference — it looks fantastic! I also love the black hutch with white dishes! Wow! Great work. I love proving that you don’t have to spend a fortune for big impact. Love this kitchen! love your kitchen! Looks great! This is my favorite post ever!! Amazing transformation!! Really love it! It’s nice not to have to spend a fortune on redoing something and congrats on getting the countertops as a gift! That’s awesome! Your new kitchen is a summation of a fabulous and beautiful look! Black and white theme is a typical, yet elegant kitchen theme. Your cabinets, particularly, are like white glazed. That alone, brings sleekness in your kitchen. Your husband did a great job!!!! Your kitchen looks elegant!!!!!! It is a major venture to design a kitchen, however it is worth it if you are planning appropriately. We chose to remodel our kitchen this particular summer because we found bug poop inside the wood right behind the cupboards and there ended up being rain water damage.We thought we would address as well as change the solid wood lurking behind the cabinets. We attempted to avoid wasting the cupboards but it was nearly impossible. Amaze- yeah, maybe it is the right word to describe to what I feel after seeing all the transformations of your kitchen to the point that you were not able to pay for those things a lot. I also want to remodel my kitchen If I only have time to do that. Savannah – great job on your kitchen, especially on a small budget. I would love to know where you got your bar stools. Thanks for sharing. What’s the material of the sink? And what business was it from? Do you happen to know what the cost of it would have been? Your kitchen looks great! What a difference. This is so awesome! I wonder that you really did this in just 400$. Our home has such a tiny kitchen so I’m always looking for beautiful inspiration to utilize our small space. Thanks for sharing, Great job, if anyone is looking for kitchen remodeling companies near me then visit the site.